A pair of Kentucky Wildcats are getting their second shot in the NFL. Linebacker Josh Forrest has signed with the Seattle Seahawks. A sixth round draft pick in 2016, Forrest played in ten games for the L.A. Rams in 2016. Last year he appeared in a pair of games for the Seahawks before an injury sidelined him for the rest of the season. He has another former Wildcat with him in Seattle, wide receiver Kayaune Ross. Offensive tackle Kyle Meadows didn’t do enough to last in Green Bay. Instead of being a Packer, the undrafted free agent has been signed by the Pittsburgh Steelers. At some point he’ll likely block Farrington Huguenin, who spent last season playing linebacker on the Steelers’ practice squad. The signings of Meadows and Forrest now give Kentucky 15 players on NFL preseason rosters. There’s a new helmet-to-helmet rule in the NFL, and former Kentucky linebacker Danny Trevathan is a good reason why it was implemented. According to the new rule, players will be penalized 15 yards and possibly disqualified from the game depending on the severity of the hit, specifically if the player lowers their head to initiate contact. It’s a rule very similar to the targeting rule in college football, except NFL players can now be ejected, fined, and even suspended for several games for illegal hits. When asked about the new rule change, Trevathan said he knew a big part of it had to do with a controversial hit he had last season. This was the play in question from last season, where he knocked out Davante Adams of the Green Bay Packers. Adams was hospitalized but ended up avoiding any serious injuries. After the hit, Trevathan said it wasn’t intentional and he was just doing his job. Trevathan said he wasn’t a dirty player and didn’t deserve a suspension, though the league eventually forced him to sit out for two games. Despite missing four games due to injury and suspension, the former Kentucky linebacker led the team with 89 tackles and was the only member of the defense to record a sack (2), interception (1), forced fumble (1) and fumble recovery (1), per ChicagoBears.com. He missed the first ten days of training camp this offseason due to a hamstring injury, but returned today for the first time. In his first media appearance, Trevathan acknowledged he has lofty goals for the 2018-19 season. Another former Kentucky Wildcat has earned a shot in the NFL. 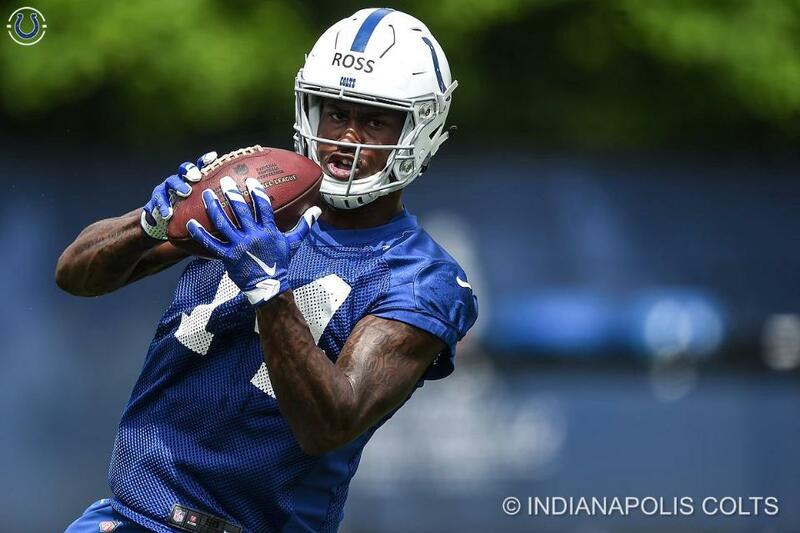 Wide receiver Kayaune Ross initially signed with the Indianapolis Colts, but was waived in June. Now he’s found a new home with the Seattle Seahawks. Listed at 6’5,” Ross reported to training camp as a tight end. A former JUCO transfer, Ross caught 19 passes for 286 yards and a touchdown in two seasons at UK. If Ross can survive the cuts from 90 to 53, hopefully he can replicate the success of another big UK wide receiver who stole the Seattle spotlight. Chris Matthews was an undrafted wide receiver that caught four passes for 109 yards and a touchdown in Super Bowl XLIX. It’s still talking season in college football, but they’re already popping pads in the NFL. Over the next week players are reporting to training camps across the country. A few Kentucky Wildcats are already back to work. Garrett “Juice” Johnson is entering his first training camp with the Chicago Bears. The wide receiver who signed as a free agent will have about a month to prove he’s good enough to catch Mitch Trubisky’s passes this fall. Luckily, he has another Wildcat, linebacker Danny Trevathan, in Bourbonnais, Illinois to help guide him through the process. Louisville’s Lamar Jackson is drawing all of the attention in Owings Mills, Maryland, while a Wildcat prepares for a breakout season on defense. Za’Darius Smith showed flashes in 2017 with 3.5 sacks in the first month of the season, until injuries derailed his progress. This week is his first step to getting his career back on track. The rest of the NFL Cats will get back to work later this week, and a few are in new places this fall. One former Kentucky football player will have to look elsewhere to keep his NFL dreams alive. Offensive lineman Kyle Meadows has been waived by the Green Bay Packers. Source: the Packers have claimed G Ethan Cooper off of waivers from the Giants. OT Kyle Meadows was waived to make room. He had signed with Green Bay as an undrafted free agent on May 4. At Kentucky, Meadows started his final 35 games at right tackle, totaling 43 total games as a Wildcat. Now, he’ll have to find a training camp invite elsewhere. Three former University of Kentucky Wildcats will be inducted into the Kentucky Pro Football Hall of Fame. Tonight Wesley Woodyard, Guy Morriss and Tommy Bell will be honored at the Lexington Opera House. Woodyard will be inducted into the Hall of Fame while he’s still playing. Entering his fifth season with the Tennessee Titans and his tenth year overall, last year he was a finalist for the Walter Payton Man of the Year Award. Also a member of the UK Athletics Hall of Fame, Woodyard helped the Cats win a pair of Music City Bowls under Rich Brooks and has been named a team captain at every level of football. Morriss is most well-known for turning a two-win team into a seven-game winner with Jared Lorenzen back in 2002, but the former UK head coach is being honored tomorrow for his accolades in the NFL. A 15-year veteran, he played on the offensive line in New England and started at center in Super XV for the Eagles. Morris briefly returned to the local high school ranks but had to put down the whistle as to battle Alzheimer’s. Tommy Bell has an undergraduate and law degree from UK. He participated in UK radio broadcasts, served on the athletics board and Board of Trustees. Tomorrow night’s recognition is for his 15 years as an NFL referee. A two-time Super Bowl participant, Bell is the only person to ever officiate a Super Bowl and an NCAA Final Four. Four current Wildcats — Benny Snell, C.J. Conrad, Josh Allen and Darius West — will also be honored during the ceremony as members of the All-Commonwealth Team. Tickets for the 7:00 p.m. ceremony are still available at http://kyprofootballhof.org/. The former Kentucky linebacker grew up in a large family and always knew he wanted to have one of his one. 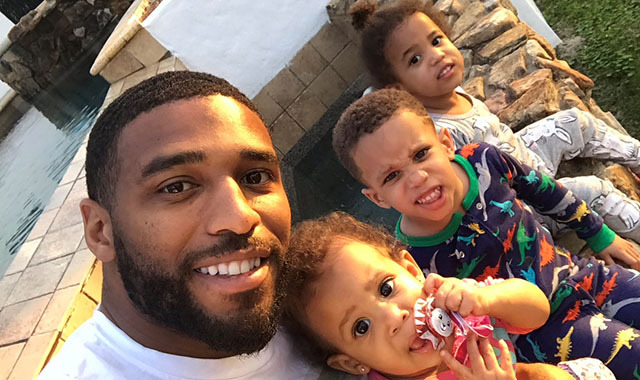 Woodyard and his wife, Veronica, are parents to three children: son Greyson, 5, and daughters Noah, 2, and Luca, 1. Woodyard was five years into this NFL career when Greyson was born. Woodyard was ready for the change. The NFL season is a busy one. Woodyard makes sure he spends all his free time with his family. Woodyard is entering his 11th season in the NFL, his 5th with the Tennessee Titans. Former Kentucky wide receiver Kayaune Ross has been waived by the Indianapolis Colts. Ross earned a roster spot with an impressive performance at the Colts’ rookie mini-camp, signing with the franchise back on May 18. After nearly one month on the team, the former Wildcat was cut from the 90-man roster. The 6-foot-6 receiver caught 16 passes for 219 yards last year for the Cats, building off of an injury-plagued first year at Kentucky. Listed as a junior on the depth chart last July, the coaching staff expected him back for the 2018 season, but his eligibility clock apparently expired this season after enrolling at two junior colleges before getting to Kentucky. Ross will have to latch on with another franchise to keep his NFL dreams alive. Former Kentucky wide receiver Kayaune Ross has signed his first NFL contract. Ross earned the roster spot with an impressive performance at the Colts’ rookie mini-camp. A junior college transfer, Ross came into his own in 2017 after an injury-plagued first season in Lexington. The 6’6″ wide receiver caught 16 passes for 219 yards last year. The Kentucky coaching staff expected him to use that momentum for an outstanding 2018 season, but his college eligibility ended prematurely. 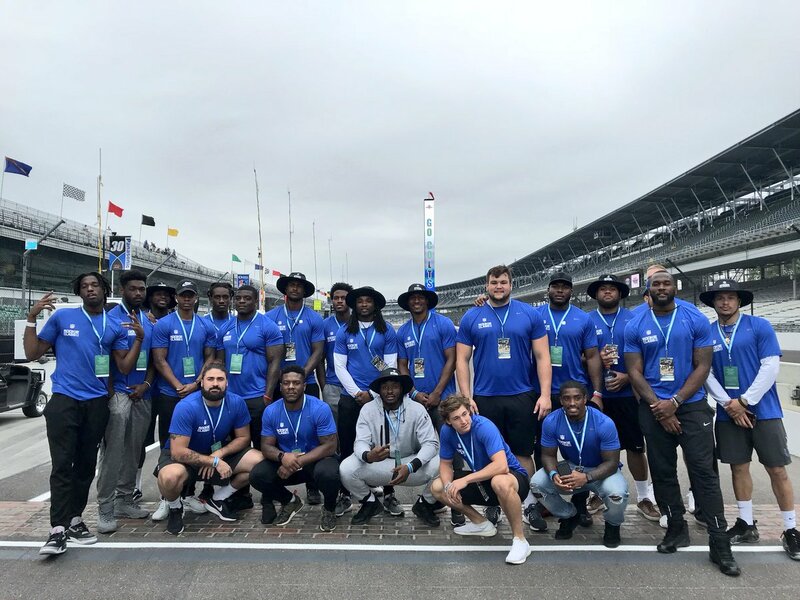 Instead of preparing to play for UK next season, he’s making money with the Colts and hanging out at the Indianapolis Motor Speedway in a bucket-hat. Not too shabby. More than a handful of Kentucky Wildcats are trying to earn a paycheck this weekend at NFL Rookie Mini-Camps. Each NFL team gets two weekends to host camps for prospective and signed first-year players. A few Wildcats got a head start last weekend. Offensive tackle Kyle Meadows, who has already signed a free agency deal with the Green Bay Packers, was one of the first on the field. Matt Elam also got in on the action with the Baltimore Ravens. Like Elam, Courtney Love is looking for a contract. Last weekend the former UK team captain tried out for the Browns. The linebacker told Steelers Depot he’s on Browns’ wait list. While he waits for the call, this weekend Love is trying out for his favorite team, the Pittsburgh Steelers. Today four Wildcats are playing for a contract. Kendall Randolph is trying out for the Philadelphia Eagles, Kayaune Ross for the Indianapolis Colts, Chuck Walker with the Detroit Lions and Austin MacGinnis with the Chicago Bears. MacGinnis will have some Kentucky company with him, but Juice Johnson has already signed a free agency deal with Chicago. On behalf of KSR, best of luck to all of the Cats as they pursue their NFL dream. Matt Elam’s football career isn’t over just yet. The former UK defensive tackle, one of the most-prized signees of the Mark Stoops’ era, has accepted an invite to participate in the Baltimore Ravens’ rookie mini-camp. Elam and all the other NFL hopefuls will report to their respective mini-camps either this coming weekend or the next, depending how each individual team decides to do it. Rookie mini-camps are a three-day event featuring somewhere in the neighborhood of 50-60 players, drawn from draft picks, undrafted free agents, mini-camp invitees and other prospects seeking an opportunity in the league. In Elam’s case, he’s trying out for a team that already had a Matt Elam on its roster for three seasons, so maybe they could stretch the old Elam’s jersey out and go ahead and give it to the Kentucky Elam. Elam will also have a former UK teammate in Za’Darius Smith there to help fight for him. Kayaune Ross has earned an opportunity to make an NFL roster. The 6’6″ Kentucky wide receiver has accepted an invitation to the Indianapolis Colts’ rookie mini-camp. Another one of Ross’ fellow receivers, Charles Walker, will participate in the Packers’ mini-camp. Linebacker Courtney Love will camp with the Browns and Austin MacGinnis will camp with the Bears. Accepting a rookie mini-camp invitation is different than those who signed free agency deals. Juice Johnson signed with the Bears and Kyle Meadows signed with the Packers. They have a contract, which gives them a better shot at moving on to the next stage toward the 53-man roster. Those who simply camp receive a stipend to attend, but have to fight even harder to receive a contract and make the next round of cuts. The Mac will try out with the Monsters of the Midway. Kentucky placekicker Austin MacGinnis has signed with the Chicago Bears and will attend their Rookie Mini-Camp. Finding a roster spot won’t be easy for UK’s all-time leading scorer. This offseason the Bears signed free agent kicker Cody Parkey to a four-year deal with $9 million guaranteed. Parkey’s stats with the Dolphins were solid, but stats are losers. For kickers, all that matters are game-winners, and MacGinnis has a few of those. In addition to yesterday’s signings, UK offensive lineman Kyle Meadows has reportedly signed with the Bears’ biggest rival, the Green Bay Packers. Former Kentucky linebacker Bud Dupree is in Pittsburgh to stay…for two more years, at least. This morning, the Steelers announced they have exercised the fifth-year option from Dupree’s rookie contract. He will earn $9.232 million for the 2019 season, according to NFL Network insider Ian Rapoport. The Steelers took Dupree with the 22nd pick of the 2015 NFL Draft, and in three seasons, he’s started 24 of 38 games, including 15 last season. Over three seasons, he’s accumulated 90 tackles, 67 solo, 14.5 sacks, one forced fumble, and one fumble recovery. Last year, he had 40 tackles and a career-high six sacks, helping Pittsburgh to a record 56 sacks. Never satisfied, Dupree said they can do even more.